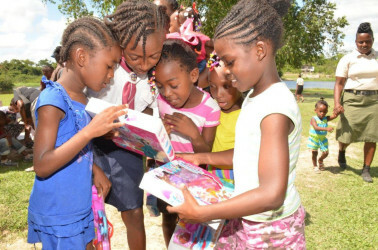 President David Granger yesterday arrived in Baracara, Region Six to a warm welcome from residents and delivered a message of self-reliance and gifts to the children. A release from the Ministry of the Presidency said that Granger was join-ed by Minister of Social Cohesion, Amna Ally. He said that while the main purpose of his visit to the riverain community was to take Christmas cheer to the children, he was also there to ensure that the village was no longer left behind. “I am President of all Guyana and I don’t want to see any part of Guyana left behind. I don’t believe in hinterland and coastland. I don’t believe in ‘bush’ and ‘town’. I believe in Guyanese living in their communities. If I believe that, I cannot allow Baracara to be left behind. If I believe in equality…”, the President declared. He said that what Baracara needs is to become a productive economic unit and said his Government is prepared to work with the community to determine the feasibility of agro-processing opportunities. Residents of the community, who are mainly involved in logging and farming, were urged to become producers, the release said. Granger took gifts in the form of a 46-inch television and a DVD player for the community and toys for the children. 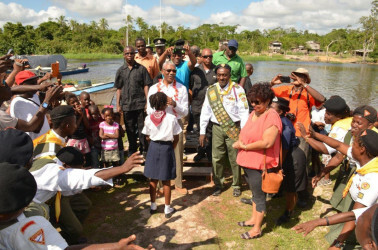 He also announced that the community will benefit from the gift of a school boat, under the “Three Bs Programme” before Guyana’s Independence Anniversary, next year. Granger added that because of the importance of the information super highway in a technological world and the need for adult learning opportunities, he is prepared to discuss with community leaders the setting up of a Learning Centre for adults, which will enable access to computers. “We have to ensure that you have the power, you have the machinery, you have the equipment, you have the computers to enable your access to the World Wide Web”, he was quoted in the release as saying. The release said that members of the community welcomed the President enthusiastically with song and a military style display from the Seventh-day Adventist Pathfinders group.